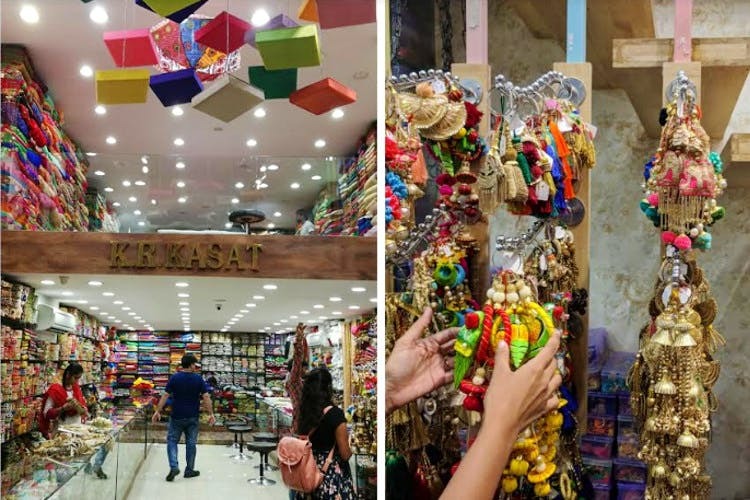 Ladies, take feast your eyes on KR Kasat, a fabric store in Punjagutta, that houses hundreds of varieties of fabrics that start at INR 50 per metre. Your Bollywood attire dream is finally going to come true. For floral dupattas, accessories, and fabric pieces that you can mix and match to bring out the inner Manish Malhotra in you, this store is where you should head to. It has two floors — the ground floor has accessories and dupattas. Here, you’ll find simple dupattas (like bandhani, cotton, chiffon) from INR 599 as well as dupattas with elaborate embroidery or mirror work that are priced at INR 1,500 and upwards. We think these are perfect as wedding couture as they are heavy too. The first floor is a non-fussy affair (unlike the well put together ground floor) with aisles and aisles of fabrics. From Benaras silk to brocades to fancy cotton fabrics, discover the most trending designs here. In fact, we were told that the store doesn’t make space for outdated designs. While the prices of fancy cotton fabrics are INR 190 and upwards, the chikankari are priced at INR 250 (but the options are limited). The brocades and Benaras silk are a bit on the expensive side, nevertheless, you can find some pretty ones at INR 800 and upwards. We found plain fabrics (for mix and match) at INR 50 too. The store’s entrance leads you to the accessories section, and ladies, this is galore of laces and accessories. Find doris for your kurtas and blouses in different colours and patterns. For instance, we picked a pair of pink elephants for our anarkali at INR 160 only. If you are looking for laces or blouse borders, this store has a vast collection that’s priced anywhere between INR 80-700 per metre (depending on your choice). We are also loving the blouse neck-pieces and corsages on display here. Floral brooches also make an appearance here, so if your kiddie’s frock needs one, you know where to grab them. We’ve done the math – if you’re interested in getting an anarkali stitched, it should cost you between INR 650-4,500 depending on your choice of design and work. If you’re looking for indo-fusion prints, we recommend the pure cotton section with prints of elephants, bicycles, and all things fun. With a good tailor, you can get a skater dress stitched under INR 500-600. Now, isn’t that a deal worth rushing to the store for?